With Perseiden Dominik Häring brings falling stars into our living rooms. As melodic sounds they flare up and cause a feeling of felicity in the cold days of winter. With 10 minutes full of hypnotic melodies and warm basses he presents us 1000 wishes. Tagträumer² grabs the melodic essence of this track and reflects it in an atmosphere of Deep House. Thereby he manages not to lose the basic idea of the original despite his dance floor affinity. The donated wishes will at the latest be come to fulfilment with Vorhang auf, where a moving bass comes upon interesting ambient sounds. Robin Raubvogel attends to this track and lifts up the curtains for the club. With the first record on sceen.fm able the producer challenges the string between lounge and club atmosphere and coincident calls for spring! For the second release on the Transit Records Kyoto imprint, Kyoto underground track-maker & DJ Ryoma Sasaki lays down 2 cuts and then there’s still the remix from Berlin’s own Tagträumer² that works just as well on all floors. “Take Me Back To Myself” is the lead track with the piano riff that makes floors hot. “All Begin From Here ” is the deep house, bass heavy track that explodes with a sophisticated sax line. 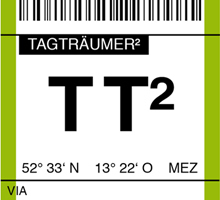 Tagträumer² has remixed this track for Transit Records Kyoto into a steady building, surging tech-house masterpiece that will sound great on club speakers. Detroit chords and big analogue synth’s make this a peak time techno floor filler, with massive DJ support from the likes of Laurent Garnier. This is Leeds based Duncan Hatterman AKA Hairy Hat Man’s Debut single and what a debut it is!The Original track “Miyagis Magic” (named after Mr Miyagi from the karate Kid films) is a flat 4/4 journey into the land of big Moog synth riff’s that light up this tune. builder added a shuffling beat and hypnotic bass-line. Leeds native and former classical guitarist James minimal score lights up in these remixes. A jackin Tagträumer² remix made for Peaktime action stomps with a stronghold of breaks, hi-hats and plethora of Roland keys. Pummeled beats are knocked out on Steve Coles in your face remix as synth overlays ferociously align rugged effects inserts over three-chord solo stabs. There’s also a self explanatory Ode To The Old School Mix, Too.